A £50 non-refundable deposit is required when booking, the balance is due 6 weeks prior to your stay plus a £50 refundable security bond should any loss or damages occur during your stay, and will refunded within 7days after your stay. 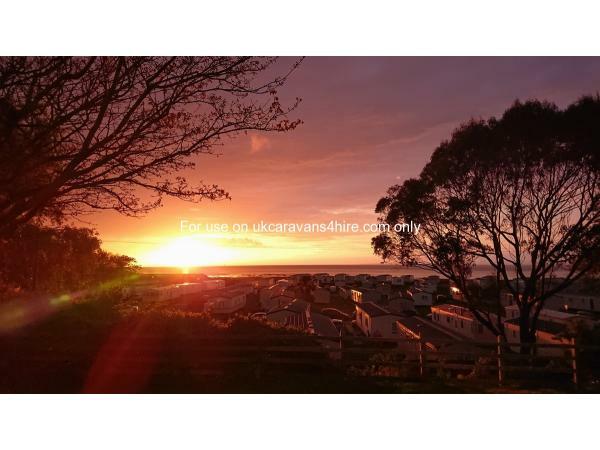 The pitch has a private parking bay and patio area with a large lawn to the front of the caravan, ideal for any outdoor activities and it is only a short walk to the site amenities. The lounge has a large L-shaped sofa with ample seating, Dining table and chairs, 32" TV/DVD, Patio doors leading out to the decking with seating and parasol. The Master bedroom with en suite toilet has a Double bed, Dressing table and plenty of storage space. The two further bedrooms have single beds and storage space. The family bathroom has Shower, Wash basin and toilet. The Caravan has central heating and is Double glazed. Additional Info: Main complex has a Heated In/Out door Swimming pool, Outside is a large Playing area, Zip wire, Climbing wall and frames.Please note that there is no fun passes included in the price. Spent a fabulous evening with friends . The caravan was spotless. The double bed was very comfortable. The entertainment at the club house was excellent, food was good too. Can't wait to go back again. This is the nicest caravan we have ever stayed in. I never leave reviews but we had such a lovely holiday. It is lovely inside, beautifully clean and spacious. The outside decking area is a real bonus, we used it all the time and my kids loved it. Sue and John were very helpful and friendly throughout. We also loved Doniford Bay park, it's a great place for a family and the staff were amazing. We can't recommend this caravan highly enough. Oh, the plot is great too, it's near the facilities but also quiet.